I meant to post this recipe during the summer, but was sidetracked. Story of my life! Better late than never right? This Reese Coffee Milkshake is easy to whip up although it does look pretty impressive at first glance! 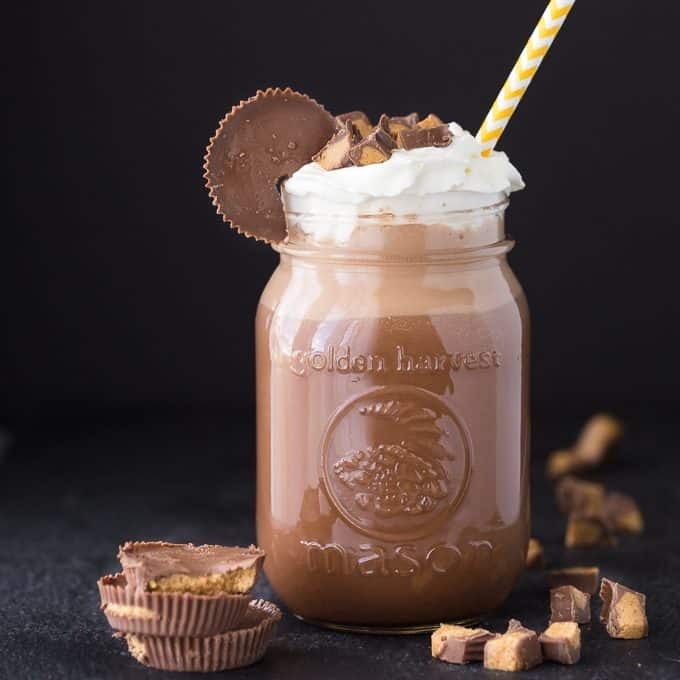 It’s made with chocolate ice cream, coffee and a couple spoonfuls of the mouthwatering REESE spread. I garnished with whipped cream and some REESE Peanut Butter Cups to make it look a little fancy for the pictures. It tastes even better than it looks! There’s something irresistible about the combination of peanut butter and chocolate. I often will grab a quick spoonful of REESE spread right from the jar. Shhhh don’t tell my kids! I’m working with REESE Spread this year, but this isn’t a sponsored post. I had made this before I started working with them many months ago. If you want to give your coffee a sweet and scrumptious kick, give this recipe a try. A coffee milkshake is good any time of year if you ask me! A perfectly cold and sweet combination of ice cream, coffee, chocolate and peanut butter. 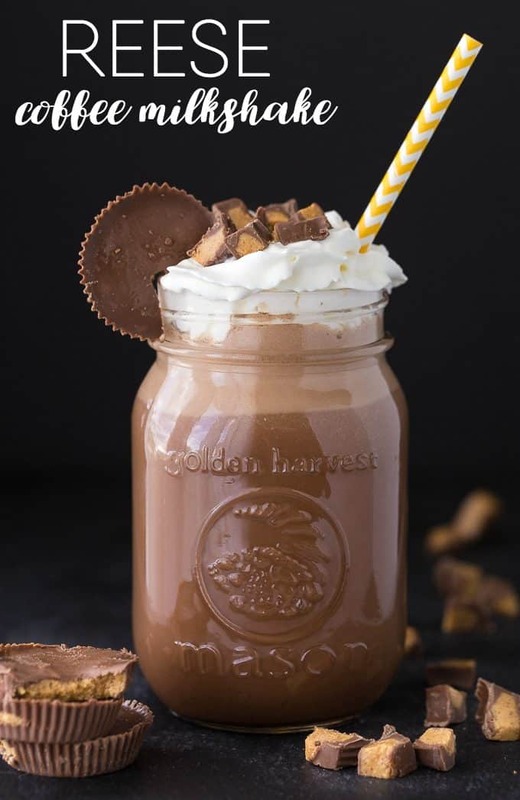 Add ice cream, Reese’s peanut butter chocolate spread and coffee to a blender. Blend until smooth. Pour into glasses. Top with whipped cream and chopped Reese’s Peanut Butter Cups. Cut a small triangle out of two Reese’s Peanut Butter Cups and fit to the rim of the glass to serve, if desired. Oh yum!! 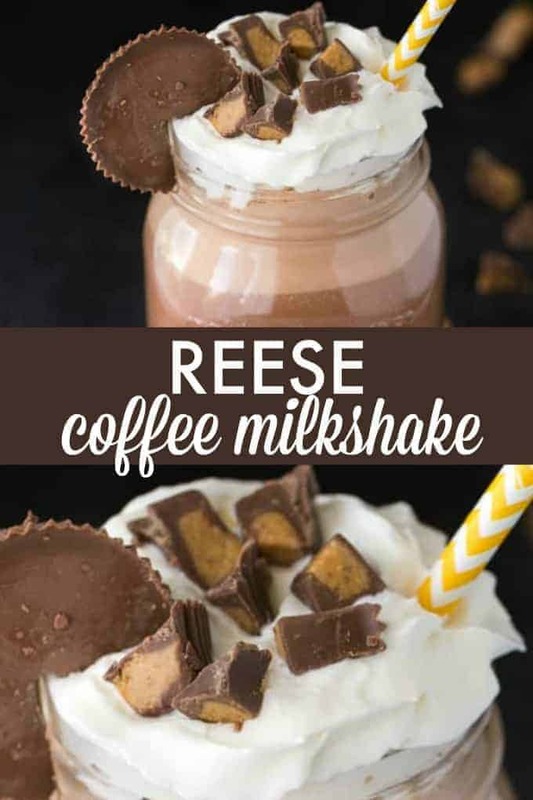 This recipe looks so delicious for a Reese Coffee milkshake. I want to make this for me and the kids. We would love it for the Holidays! amazing. I am such a sucker for pb and chocolate! This milkshade looks delicious. Can’t wait to make. This sounds so delicious! Coffee and Reeses are 2 of my favorite things. wow that looks so good! Never tried the spread yet, might get some! I love a coffee milk shake but not with peanut butter taste I’m sorry to say. Still it would be a dull world if we all liked the same things. OMG,this looks so delicious ! OMG…I have died and gone to heaven. How totally, deliciously decadent. I am thinking that I will kick it up a notch and drizzle some Kahlua over top. This looks and sounds delicious! Would be great for a snow day 🙂 Thanks for sharing! Your Milkshake looks wonderful! Thanks so much for sharing your awesome recipe with us at Full Plate Thursday! Hope you are having a wonderful week and hope to see you soon! Found these via “Lou Lou Girls Fabulous Party”. Definitely pinned! (I also thumbs upped it on StumbleUpon). Thanks for sharing. Perfect recipe for me. I adore reese’s! Thanks so much for sharing this with us at the DI & DI Link Party. This was sinfully delicious !!! This looks wonderful. I would love to make me one of these. Thank you for sharing. This looks so delicious. I want one of these NOW. Thank you for the recipe. So amazing! Love the idea.